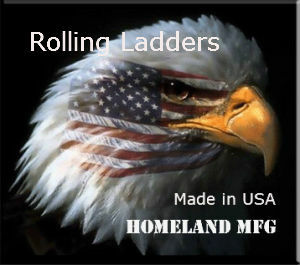 Ladders Buyers Guide, Become a Rolling Ladder & Work Platform Expert. We are Here to Answer ANY Questions 888-661-0845. Steel - We use a carbon steel on most of our products. It's the most economical material and can withstand the test of time with a good finish. Aluminum - A very lightweight yet rigid material. Aluminum is also very resistant to weather and moisture. It does not require any finish or coating. Standard Enamel Finish - All of our steel products have a professionally sprayed enamel finish. Our standard colors are Gray and Yellow. For a surcharge we can spray any color specified. 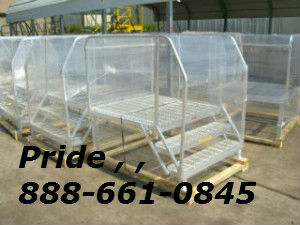 Galvanized Finish - Cleaned unpainted products are sent to galvanizing, where they will be coated several times. The galvanized coat protects the metal much better than paint. Mill Finish - Our aluminum products have a mill finish. This means the raw material only requires us to clean it before it ships out. 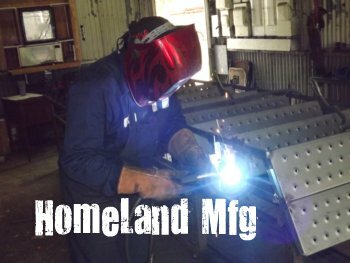 Our standard products are offered in either Perforated tread or Serrated tread. We also offer Grip Tape and Diamond Plate for other products. We have the capability to use just about any tread for all of our products and custom products. Serrated - The most aggressive non-skid surface available. Serrated teeth keep oil, mud, snow, and water from turning into a hazard. The only complaint is comfort while resting on your knees. Grip Tape - This adhesive tape has a hard grit surface. Similar to the tops of skateboards, it is recommended for indoor and dry environments. Perfect for offices and users with dress shoes. Diamond Plate - Diamond plate was the first non-skid surface ever created in the industry. It reduces slipping, however it is not recommended for oily or wet conditions. 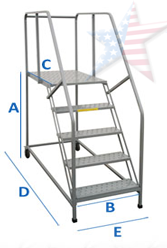 We utilize three different systems to keep our ladders from rolling away when you don't want them to. These systems are the industry standard and meet OSHA & ANSI safety requirements. 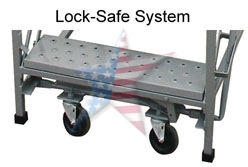 Lock-Safe System - Once the user applies weight (a footing) on the first step, the springs actuate and the casters flip up from the floor. The front pegs are now firmly planted. To unlock the Safe-Lock System, all you have to do is pull back on the side handle bar or step on the front pad. 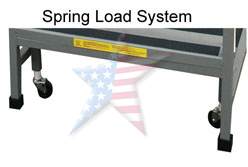 Spring Loaded Casters - The caster stems have a spring in them. Once weight is applied, the springs compress. The compression allows the pegs to be planted on the floor. The legs can only come back up once the weight is removed (getting off). Tilt and Roll - Some of our designs are lightweight and can be tilted on their wheels for portability. This design uses two wheels on one end and pegs on the other. It's a simple method, but has worked for nearly a century. 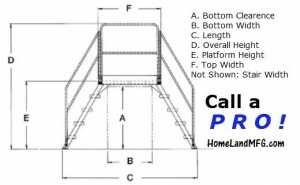 Please consult this diagram for a clarity of how we measure and describe our ladders and platforms. All shipments must be inspected for damage/shortage at the time of delivery and in the presence of the driver. If damage is visible to the outer packaging, the package should be opened and the contents further inspected. All of the damage to the packaging as well as the contents should be noted on the delivery receipt. If there is no visible damage to the outer packaging, any damage found to the contents may be considered concealed, however, should still be noted on the delivery receipt at the time of delivery and in the presence of the driver. Click Here to View Our Ladders & Work Platforms! Become a Ladder & Platform EXPERT !